I guess most of my readers know that I don’t post a lot of vegetable dishes not because that I don’t like it but my knowledge of vegetable dishes is limited. I want to change that as I love vegetables and started loving it when I met my wife who taught me how to enjoy and eat them. Yes! all of the wives out there it is possible to let your husbands eat veggies, it’s just the way you present it to them that makes the big difference. For this post I will be making an impromptu creation which is Monk Fish and Broccoli in Creamy Onion and Bacon Sauce, it was created again because of the lack of ingredients. I was initially thinking of making a noodle dish with broccoli and fish in coconut laksa sauce but I missed some of the vital ingredients which is coconut milk and noodles that is why I present you now with this dish, a very delicious discovery. Do you have a really good vegetable dish preferably with a bit of meat 🙂 that you can share with me, I really love to try them out here and will post the outcome of that trial. If you have any please feel free to put a link in that comment section so I can try it out soon. Don’t forget to tell why it is special. Thanks in advance. In a pan add oil and sauté garlic and onions, cook onions until it becomes soft and translucent. Remove from pan then set aside. Add bacon then fry until crispy. Remove from pan then set aside. Pan fry monk fish browning each side. Remove from pan then set aside. In a separate pot, boil water with a pinch of salt. Once water is boiling place broccoli and cook for 1 to 2 minutes, do not overcook you want this to be crunchy. Drain then soak in cold water to stop the cooking process. Set aside. Back to the pan, add the butter and flour. Mix until it forms a roux. Add water, cream, cottage cheese, rubbed sage, nutmeg, bacon, sautéed onion and garlic. Mix well and simmer until sauce thickens. Add broccoli and fish, mix to evenly distribute the sauce then season with salt and freshly ground black pepper. My husband is not a veggie lover before but now he always requesting vegetables supper because it is easily to digest than eating meat only, I have a recipes with vegetable and meat, but most of them are simple to prepare. Do you have links of your recipes in Erecipe? Once again looks wonderful. Like the last commenter I do beef and broccoli, of shrimp and broccoli. This would be a new twist for me. Yes, my husband would eat his broccoli if I flavored it with bacon! 😉 This looks so creamy and delicious. I have an Israeli couscous suffed zucchini on my blog. It’s all the way at the bottom of my Cover Girl Beet salad post. A shepherd’s pie with lentils instead of meat has been a hit for me, as well as well as hearty soups with tons of veggies too! It’s hard to think about hot soup in the summer though! 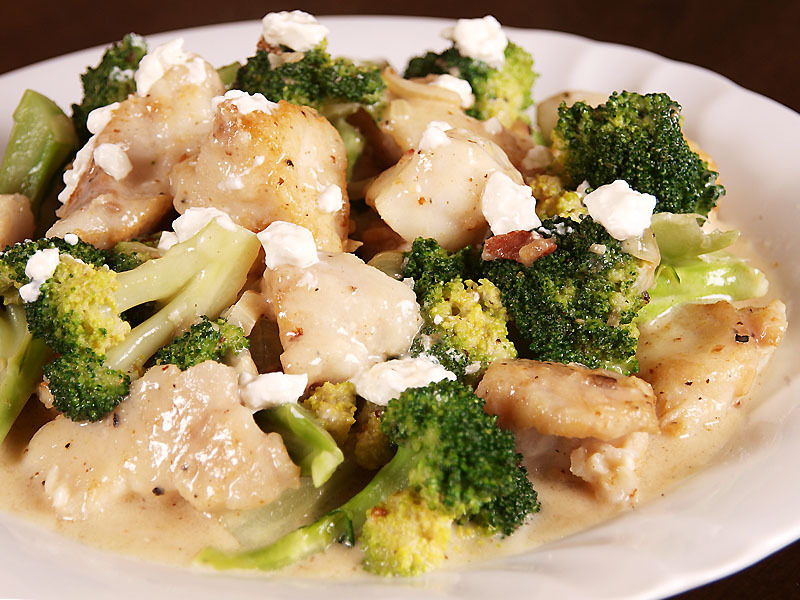 This is a very nice new idea to me to cook broccoli and fish in a creamy sauce. I wouldn’t come up with this unless it’s pasta. Looks delicious! Yummy fish recipe and will leave out the bacon. how much is the monk fish? What do you mean, how much per kilo?